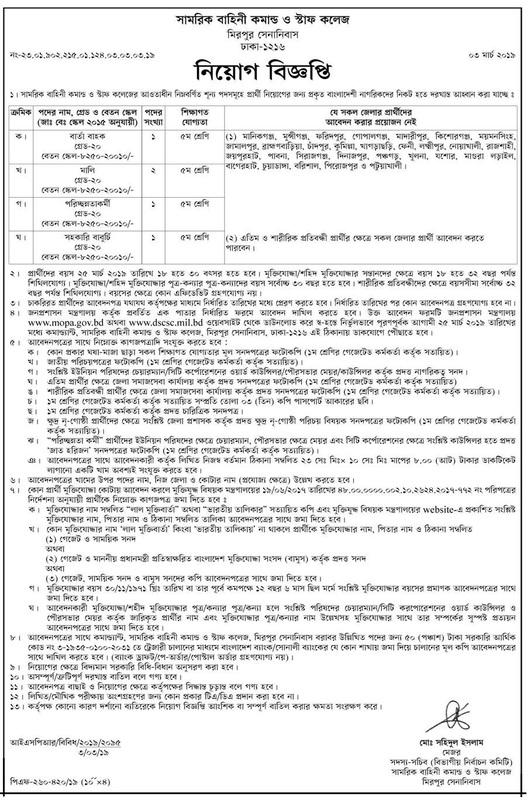 Defence Service Command and Staff College Job Circular 2019 has been published by their authority in daily online job portal and to get from the best jobs and the education portal website in BD Jobs Careers- www.bdjobscareers.com. For the user understanding, we would like to inform you that,Defence Services Command and Staff College is a prime military institution of Bangladesh Armed Forces. Established in 30th December, 1977, DSCSC provides professional military education to selected mid-career officers of the three services and prepares them for assumption of increasing responsibilities both in command and staff appointment. Here officers from the Army, Navy and Air Force from home and abroad learn about operations of war in a joint environment encompassing Land, Air and Maritime forces. The College is well acclaimed internationally as a centre of excellence for study on subjects of contemporary military interest, and has so far graduated over 4200 officers including 860+ officers from 40 different countries. The college is affiliated to the Bangladesh University of Professionals which offers a ‘MSc in Military Studies’ degree on successful completion of the course. Located at Mirpur a suburb of Dhaka city, 16 Km away from the city center, the College provides a wonderful campus with adequate infrastructure for education, training, research, housing, sporting and recreational facilities for the student officers.